I’ve been busy speaking to a LOT of people regarding MBA’s. With most of the decisions out, I have had the opportunity to speak with many new admits (and a few folks that will be reapplying next year). After speaking with many applicants and gathering notes from their experiences and my experiences, I created my “MBA Applicant Model.” This model will structure my thinking on how I will approach business schools next year. Besides the MBA Model, I have taken a couple of other actions that will help me prepare for applications next year. After several conversations, deep introspection, and working with some MBA alumnus, I have developed an MBA model that will structure how I approach applying for school this year. I hope that you find it useful as well. The first stage is the “Introspection & Research” phase. Applicants should have a well-developed narrative about who they are, what they are about, and what goals they are hoping to achieve (Personal Info). They should also make sure to bolster their GMAT, GPA, volunteer hours, etc. 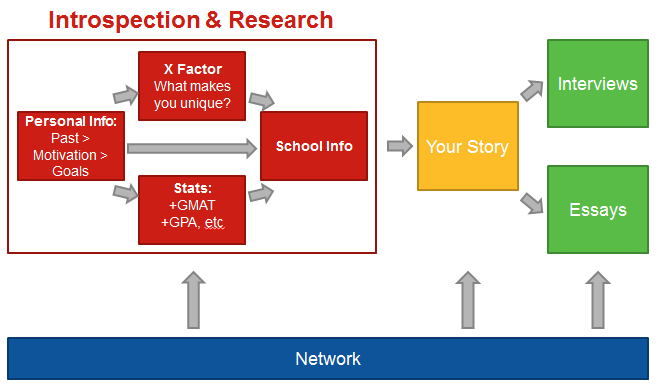 (Stats) and identify what makes them unique among other applicants and how they will stand out (X Factor). Applicants should also be researching schools and programs to understand what fits them best (School Info). Finally, how do all these factors relate? Why does the applicant apply to a particular program? The first stage directly supports the second stage, “Your Story.” Once an applicant gathers all the pieces, can they put them together to create COHESIVE and POWERFUL story that will help them stand out? I would say this is where I typically falter. While I do a great job of gathering the pieces, I can improve the entire picture of how they relate. The final stage is the “Communication Stage” that contains the Essays and Interviews segments. Now that you have a well-developed story to match your profile, can you communicate it effectively? Can you draft an amazing essay that will not only communicate your profile, but also communicate your passion and determination? Will the adcom be able to see success in your essay? And once past the first hurdle, will you be able to interview well? These are critical stages that are much easier to tackle if you put in the pre-work. Finally, the last element in the model is your Network. I tell many of my mentees that your “network is your net worth.” Your network can provide you tips and hints on how to apply, but it can also provide you an outside perspective of your profile. Have your network read your essays. Are your essays convoluted? Are they boring? Do they ring false? Have your network perform mock interviews with you. Can you answer questions succinctly and convincingly? I know that I didn’t utilize my network at all last time. I should have asked for help but didn’t. I will not make that mistake this time. .
Pre-MBA programs, classes and GMAT studying… These will be new additions to my life of corporate finance and non-profit executive. But what I am REALLY excited about, is the next evolution of GrantMeAdmission. In the next month, I will be adjusting the mission/vision of the blog AND making a huge addition. Make sure to subscribe on the main page to not miss anything! I love how clear and concise this is! Perhaps this is woven into your “story” section, but I think proving your fit with the school is also vital. Best of luck! Absolutely! If you look at the model you will see how “Personal Info” has arrows to each of the four boxes; all of the factors relate to each other. How you relate to the school (your fit) is just as important (if not more) than your personal information! Awesome revamp, refocus and renewed strategy, you shall succeed and prevail mate! Keep the energy, vibe and momentum flourishing, your tenacity is incredible and truly awe-inspiring!! !